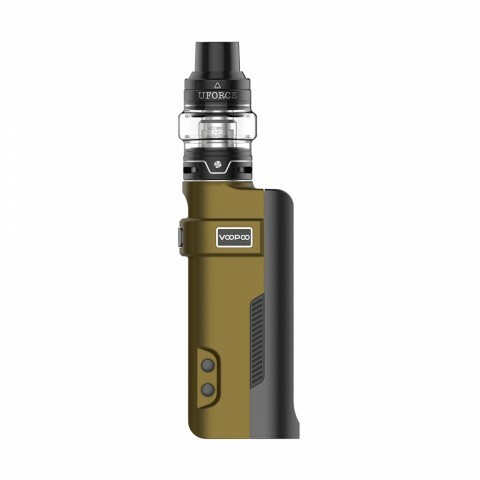 The 80W VOOPOO REX Mod and UFORCE Tank consist the VOOPOO REX e-cig starter kit. The UFORCE Tank has 2ml or 5ml capacity for you to choose from. 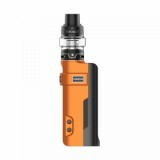 The 80W VOOPOO REX Mod and UFORCE Tank consist the VOOPOO REX e-cig starter kit. If you ever have a chance to hold the VOOPOO REX, you are gonna love it and find its quite easy to fire and comfortable to hold, due to its S-shaped body with curve-designed fire button. This is new among all the VOOPOO kit or mod. Still, worry about the lifespan of your e-cig device? Well the VOOPOO REX Mod comes with this innovative GENE.FIT chip which is born for security and long lifespan. The UFORCE Tank has 2ml or 5ml capacity for you to choose from. • Note: The UFORCE Tank is compatible with almost all UFROCE coils (P2 is not compatible with TPD version of UFORCE T2) and all of the glass tubes 2ml (TPD Version)/3.5ml/5ml/5.5ml/8ml. 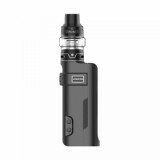 AUGVAPE AIO Starter Kit with a 1500mAh battery capacity. is a compact and convenient vape device. With 2ml liquid capacity and a built-in 1500mAh battery, you can vape for a really long time. 80W VOOPOO REX TC Kit with UFORCE Tank is an ergonomic device which features S-shaped body with curve-designed fire button for comfortable holding. Adopting the innovative GENE.FIT Chip which can block. 80W VOOPOO REX TC Kit with UFORCE Tank is an ergonomic device which features S-shaped body with curve-designed fire button for comfortable holding. Adopting the innovative GENE. Good looking kit, nice colors and good "on the go". So cool and easy to use start kit. 80W VOOPOO REX TC Kit with UFORCE Tank with UFORCE Tank is a ergonomic device which features S-shaped body with curve-designed fire button for comfortable holding. Adopting the innovation GENE.FIT Chip, the VOOPOO. The VOOPOO REX 80W TC Kit with UFORCE Tank is an ergonomically designed device which features S-shaped and curve-designed body for comfortable holding. Voopoo kit is my favorite. O Kit VOOPOO REX 80W TC com Tanque UFORCE é um dispositivo ergonomicamente projetado que possui um corpo em forma de S e projetado em curva para uma fixação confortável. 80W VOOPOO REX TC Kit with UFORCE Tank with UFORCE Tank is an ergonomic device which features S-shaped body with curve-designed fire button for comfortable holding.